When our three boys were small, we camped in a tent. Later, when we were able to purchase a truck and small camper, we put our tent camping days behind us, and I assumed we would continue to get bigger and better R.V.’s and camp with more comfort. Not too long after that, we became interested in mining. 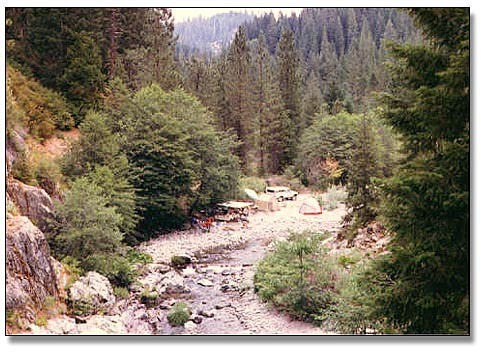 What followed was an infinite variety of mining camps that included getting into places with our camper, and later with our small motorhome, which seemed impossible and which eventually included a return to tent camping. Most of these camps were remote in varying degrees and involved “making do” without many of the conveniences we enjoyed at home. Sometimes trips to stores required a long ride with our 4-wheel drive truck. But even if they were not that bad, time taken away from our dredging was measured in small doses, especially in the early years when our dredging time was so limited. Our mining trips were so important to us that much of our free time during the rest of the year was spent with friends planning our trips and looking for ways to improve them. They did improve through trial and error. What follows are tips and information from many mining camps, ours and others we encountered along the way. They can be adapted to fit many situations, and I hope they will encourage some of you to “take the plunge,” and join those of us who love our outdoor life. R.V. living today is limitless, and those of you who have a large R.V. and stay in campgrounds with full hookups do not need many tips. You already have all the comforts of home. If you should dry camp, however, some of these tips will come in handy. Many small R.V. owners will also be able to make use of them. Tents come in many sizes and shapes, but we found that most were not suitable for heavy or long term use. Many were not suitable for mining claims! Camping areas on mining claims vary greatly in size and shape and are often sandy. We found that an umbrella tent for sleeping and a canopied area for day use provided the best solution for our mining camps. 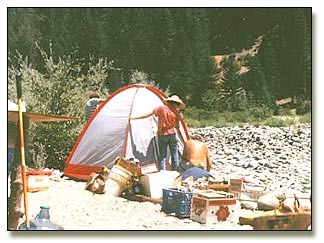 Tents collect and hold heat, and it’s much easier to find a shaded area for a small one. Umbrella tents do not require heavy ground staking. They are usable in sand, and sand makes a softer bed if you are not using cots. A large canopied area is inexpensive to build. It provides shade and large areas for cooking and visiting while letting cool breezes through. It’s also easily enclosed to keep out cold and insects. Vinyl tarps for a canopy come in many sizes and are readily available. A framework of conduit and corner fittings from the hardware store (also available at most swap meets) are easily transported and set up. If you do not already have tables, frames for them can also be made from conduit and tops cut from plywood to fit. Hung from the top canopy frame, S-shaped hooks can hold your skillets, pots and pans, spatulas and other cooking utensils handy to the stove. Paper towel holders are easily made by opening a metal coat hanger, inserting the roll, re-closing, and hanging from the frame. Be sure to clothespin the end of the roll to the hanger so a stray breeze will not unroll it. This could create a fire hazard. Dishcloths and towels can be thrown over the frame, and a clothespin holding the ends together will keep them there. A portable propane stove connected by high-pressure hose to a 5-gallon propane bottle holds enough propane to last for weeks. Coleman makes a collapsible oven with thermostat which will rest on top of one stove burner. With a little practice, this oven easily serves most baking needs and is compact. With a setup such as this and a small propane barbecue, most dishes fixed at home can easily be prepared in camp. Storing food and utensils is a little more work, as it is necessary that they be kept in mouseproof containers. With the variety of plastic containers in most households, most of us already have much of our food in containers that are sufficient. Mice will make nightly visits. You may never see one, but you may hear them, and you will see where they have been each morning! For this reason, it is also important to cover your tables with vinyl, which is easy to clean. We found it easiest to store large food items in footlockers, boxes with tight lids, or 5-gallon buckets with lids. Buckets should be new or should only have contained food prior to using them. You should plan on two other buckets. One for dishwater and hand cleaning, and one for washing light clothing. If you heat water for dishes while eating breakfast, and heat wash water while doing dishes, your clothes can soak while you are doing the day’s dredging or mining. After soaking all day, they are easy to clean when you return and can be hung to dry. My children, who are used to having a washer and dryer at their disposal, at first objected to using a towel more than once! When they found that I saved pants, whites and towels for the laundromat and were faced with washing their own, they picked one towel and got used to it real fast! stays. A small used propane refrigerator taken from an R.V. is ideal, but you need really shop around for one because prices vary greatly. Planning for your food can be your single largest time and money saver. Before you even leave home, it will be helpful to make a list of the foods you normally cook and eat. Next make a visit to your grocer’s shelves to check new things, and find substitutes for fresh meats and perishables. Forget the frozen section and concentrate on things that are stored and fixed easily. You might even experiment a little. My family will not eat canned beef “straight,” but in a sauce such as for barbecued beef, sloppy joes, or even in tacos or burritos, seasoned, it is perfectly acceptable. Canned beef, chicken, turkey, tuna, and others can be used in many ways. Canned ham that needs no refrigeration is available, as is canned bacon. When choosing meat to freeze in a tiny freezer, choose deboned and lean cuts and ground beef, which molds to fit available space. When choosing fresh meats for storage in an ice chest or refrigerator, use ground beef within 1-2 days, pork the next day, then steak cuts, and roasts last. In warm weather, use ground beef immediately, and move the use of everything up a day if using an ice chest. It is helpful to take a small ice chest shopping with you. Have them bag the refrigerated food together, and keep it on ice on the way back to camp. This is especially important if using an ice chest for keeping your food cold. Cooling down food that has grown even a little warm will seriously deplete your supply of ice and lower the quality of your food. Even under ideal conditions, breads do not keep very long, but tortillas (easily refrigerated), cornbread, crackers, and biscuits all make good substitutes. Bisquick biscuits are fast and easy to make: Add 1/2 C. water to 2 C. Bisquick. Mix until dough cleans sides of bowl and forms a ball. Place on waxed paper (or plastic wrap, etc.) with a little Bisquick sprinkled on it, and knead five times. Roll or pat out to 1/2 inch thick, cut with cutter (or glass) and bake at 450 degrees for 8-10 minutes. Breakfast doughnuts can be made by patting the biscuit dough a little thinner, cutting a center hole (use the lid from a 4 oz. gold vial if you haven’t a cutter), brown in hot oil a few seconds on each side, and shake in a bag filled with a cup or so of granulated sugar. A trash barrel with a tight fitting lid is important to keep critters and flies away. Full trash bags should be removed quickly and kept in a closed vehicle until removed to a dump. It is essential to keep a clean, trash-free camp to avoid unwanted visits by animals, small and large. Showers can be easy and very comfortable (actually a joy), even if you do not have facilities. Solar shower bags are readily found at camping supply stores, and the 5-gallon size bags hold enough water for two good showers. When placed in the sun in the morning, only about four hours of sunlight is needed to heat the water. Suspended overhead from a pulley, they are very efficient and provide nice, hot showers. 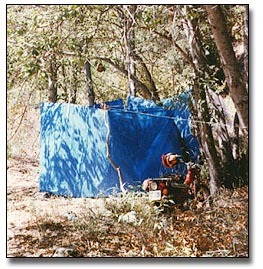 Once again, vinyl tarps serve well to enclose the shower area, attached to existing trees or to a horizontal frame of PVC pipe suspended from a limb. A rope with clothespins, hung inside, will hold towels and clothes. An upended bucket provides a seat and place for soap and shampoo. Large metal clamps from the swap meet will keep the door flap closed for prlvacy. Smooth river stones make a comfortable floor, and if you can bury your tarp walls in sand, you will keep stray breezes out. Toilets can sometimes seem an insurmountable or worrisome problem, to say the least. We havc found two ways to make them as painless as possible. If individual permission can be obtained from the local Forest Service Mining Officer, and it is convenient, a deep pit can be dug 200 ft. or more above high water line. A seat and platform can be built to cover it, and a bag of lime should be kept handy. Two cups of lime should be placed into the pit after each use. The area can then be enclosed for privacy. Where accessibility permits, chemical toilets can be rented, with the local pumping service coming around and servicing them as often as necessary. One popular alternative is the portapotti. They have larger capacities than they used to and are clean and sanitary enough to be kept in a sleeping tent, if desired. Portapotties are easily emptied into a “sewer tote,” which is a portable, hard plastic holding tank with a larger capacity–up to that of an average R.V. The sewer tote can then be taken to a dump station when full. These are also convenient when dry camping in an R.V. We have found that one full day, or even half of the second day, with everyone pitching in to set up camp was well worth it. An organized camp always makes our trips easier and more enjoyable for everyone. A comfortable, efficient camp provides many of the comforts of home, improves the efficiency of your mining operation, and can turn a possible disaster into a great trip. Some of those disasters have kept us in stitches when sitting around campfires at a day’s end. There is no way to describe the warm, wonderful feelings we have all shared on those nights. The songfests that drew strangers to us, wanting to share and join in. The tales of adventures shared and the kinship felt with the first miners who came west to find gold and settle the country. These were the real rewards of our mining trips and were what lured us back each year. New experiences and adventures, new friends… and, of course, there was always the chance that this year we’d find that BIG nugget. For more about our mining claim, see Our Own Claim… the Great Adventure!